Got new HM up and running. 4.3 and pi zero W.
Wont connect to my home network yet from config.txt or downloaded image. Connect to HM via wifi, i can set up network connection via interface and it does vonnect to home router .Then wifi for HM dissapears...cant connect with another device. Now, wanting to go back to direct phone wifi connection, i disabled that network connection with home router....this seem to disable all the wireless of the pi...had to put re-imaged card in pi to be able to talk to it again . Should i have "removed" that network to disable it? Its nice to always know same address if connect direct at home and switch to it if needed. Yeah i know about ddns, havent got to that yet. Last edited by MartinB; 01-18-2019 at 07:54 PM. Well, sounds like you had it working but didnt know it perhaps? If you started from an Access Point build and used a wireless device to scan for available networks and connected to HEATERMETER, then loaded the HM web gui and went to config/network/wifi and scanned for and connected to your wireless network, when you apply that change your HM changes from AP mode to Client mode and you will no longer see the HEATERMETER access point if you scan with a wifi device. At this point you are connected to your wireless network and need to connect to whatever IP is assigned to your HM by the router (from any device connected to the same network). When the HM boots it should show the IP address on the LCD, or you can go to http://heatermeter.com/devices/ to see if your device is listed there. My question is...if i dont want to connect to that network anymore...maybe it not at home, or router issues, etc. I "disabled" it, and then HM didnt talk to anything. No ip address on startup, no AP. To reset that configuration without wireless required new image, unless plugged into pi with cable maybe. So will " removing" the network put it back in AP? Because disabling seem to render it unable to communicate anymore via wireless. Last edited by MartinB; 01-18-2019 at 08:36 PM. I suggest you try RESET from the HM LCD menu, see if that puts it back into AP mode. If not I would dl the image from heatermeter.com/dl that matches your needs and write that to your SD card and start out fresh.., and dont delete your network devices. 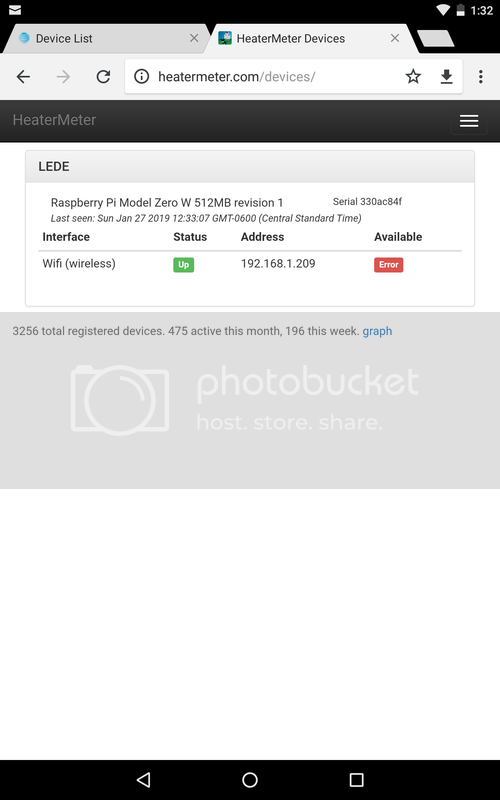 I would not ever disable or delete the wifi interface from the webui, as there will be no way to re-enable it on a Pi Zero W without reimaging the SD card or using the "Reset Config?" from the HeaterMeter device LCD menu. Reset Config resets all config of the HeaterMeter itself as well as the Pi's configuration if it is up and running at the time. This will reset it back to being an access point you can connect to called "heatermeter" (not to being a wifi client). If you disable or remove the wifi network in the webui, it will NOT go back to being an access point, it will just not have a network anymore after that. Well, not the wifi interface, but thats possible too. It seems, just network you joined. But same thing, it gets stuck without wifi communication. So reset config is the way to change back to AP. But you lose probe and tuning settings? And wifi network/password too . Would be a bit of hassle to reconfig all in middle of a cook. ( Yeah, it would take about 1 min). Can the baseline image be modified to your normal parameters ? I saw some backup options, not sure what they do. Last edited by MartinB; 01-19-2019 at 10:37 AM. Have a button on the HM Config page to "save config" and choose number (perhaps 1-9) that will stash a config file with that number on the SD Card. Add menu to HM LCD for "load config" and allow you to select 1-9, push button, done. Apparently not as simple as I would like it to be. Other methods have been discussed here that work to save/load configs using the web etc, but nothing as simple as the above or that can be done from the HM hardware when you do not have a network connection... and that's when you really need it, right?! If you DL the client mode image with your wifi credentials from the HM website and update the HM via its web gui you will not lose all your other settings, so that is one way to change config, but you need a network connection to do that, or need to image the SD card. Maybe you could stash those configs on the SD card and then load them from the HM config menu, but once again without a network connection you can't get to the HM config GUI to do that. Another method is to have multiple wifi adapters and config each one for a different network or mode. Then boot with the network adapter for the network you are looking to connect to. Less than ideal but is probably the easiest way to change networks. You've hit on a long standing humbug with the HM which I wish would be overcome, it's one of the few features I have been looking for that haven't materialized over the years I have been happily using the HM. Last edited by RalphTrimble; 01-19-2019 at 11:07 AM. If you DL the client mode image with your wifi credentials from the HM website and update the HM via its web gui you will not lose all your other settings, so that is one way to change config, but you need a network connection to do that, or need to image the SD card. Just to clarify this point, if you do a "reset config" you always lose all configuration when the Pi is reset, it will not go back to client mode regardless of the image initially used. The "preconfigured" image only works the first time it boots, to prevent from resetting the wifi configuration on every boot. I'm not sure how much network reconfiguration you'll be doing on a regular basis, but if you are, I'd recommend going to a Pi 3B+ which has its USB ports exposed through the case. Then you can just put the wifi config you want on a USB stick and when it boots, it will pull the wifi configuration from the USB stick. That makes things a little easier than opening up the case to reflash the SD card every time you want to make changes. If you're only doing a one time setup, or once every blue moon, then you can use the LinkMeter -> Wifi webui to quickly change to AP mode or to client mode. Hm works fine as access point. Tried reset, new images, always same. Hm also doesnt appear on routers device. List......even though it seems to have assigned an address. Is it possible that even though nothing shows for the network with my router yet when AP connected, none exists, once i create it it automatically disables still??? Because i disabled it once? Somhow that config doent reset? When i hotspot my phone....i can connect the HM to it and connect to it thru the assigned address. 192.168.43.209..
Last edited by MartinB; 01-27-2019 at 01:39 PM. From the parts I do understand it sounds like your HM connected to your router at some point but is not currently connected. That would explain not showing up in the routers device list. I would suggest you momentarily drop security on your router then reboot the HM, see if it connects, look on the HM LCD for an IP to show. If it shows use a computer on your network to connect to that IP with a browser. If you get connected then enable security on your router and see if it still works. On the HM AP mode and Client mode are two different things, you're running one or the other. In AP mode the HM functions autonomously as its own hotspot, works pretty easily because it doesn't have to interact with other devices, when it does it is in control assigning IP's etc. In Client mode your network is in control, the HM tries to connect to the network using the settings and credentials you have entered in the HM but your router has to allow access and assign IP's etc, so client mode can be more complicated. I suggest you put your HM in AP mode, connect with your phone and go to network/wifi section. Temporarily turn off security on your router and then SCAN for WIFI networks with your HM, pick your network and try to connect. If that seems to go well you can try the HM devices page to get the IP or watch the LCD for the IP. Use browser from computer on the same network (not the phone that was connected to AP mode) to connect to HM. If it works re-secure your WIFI and cross fingers it keeps working. If it drops then you have an issue with the firewall.